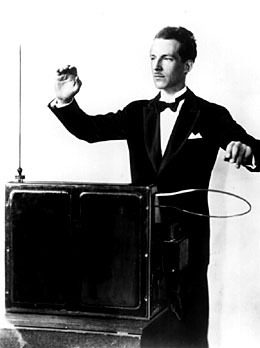 The theremin was originally the product of Russian government-sponsored research into proximity sensors. The instrument was invented by a young Russian physicist named Lev Sergeivich Termen (known in the West as Léon Theremin) in October 1920 after the outbreak of the Russian civil war. After a lengthy tour of Europe, during which time he demonstrated his invention to packed houses, Theremin found his way to the United States, where he patented his invention in 1928 (US1661058). Subsequently, Theremin granted commercial production rights to RCA. During the 1930s Lucie Bigelow Rosen was also taken up with the theremin and together with her husband Walter Bigelow Rosen provided both financial and artistic support to the development and popularisation of the instrument. In 1938, Theremin left the United States, though the circumstances related to his departure are in dispute. Many accounts claim he was taken from his New York City apartment by KGB agents, taken back to the Soviet Union and made to work in a sharashka laboratory prison camp at Magadan, Siberia. He reappeared 30 years later. In his 2000 biography of the inventor, Theremin: Ether Music and Espionage, Albert Glinsky suggested the Russian had fled to escape crushing personal debts, and was then caught up in Stalin's political purges. In any case, Theremin did not return to the United States until 1991. The theremin is rare among musical instruments in that it is played without physical contact. The musician stands in front of the instrument and moves his or her hands in the proximity of two metal antennas. The distance from one antenna determines frequency (pitch), and the distance from the other controls amplitude (volume). Most frequently, the right hand controls the pitch and the left controls the volume, although some performers reverse this arrangement. Some low-cost theremins use a conventional, knob operated volume control and have only the pitch antenna. While commonly called antennas, they are not used for receiving or broadcasting radio frequency, but act as plates in a capacitor. Easy to learn but difficult to master, theremin performance presents two challenges: reliable control of the instrument's pitch with no guidance (no keys, valves, frets, or finger-board positions), and minimizing undesired portamento that is inherent in the instrument's continuously-variable-pitch design. Pitch control is challenging because, like a violin or trombone, a theremin can generate tones of any pitch throughout its entire range, including those that lie between the conventional notes. And, unlike most other instruments, the theremin has no physical feedback (other than sound), like string tension or the tactile fingerboard for strings, or air column resistance in wind instruments. The player has to rely solely on what is heard, and can only correct a pitch when its volume is not at zero. 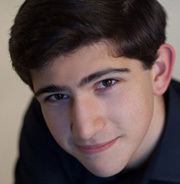 Examples of works well suited for performance on the theremin include Massenet’s Thaïs-Méditation (originally for violin), Rachmaninoff’s Vocalise, and Saint-Saëns’ Le cygne (The Swan) (originally for violoncello). >> read more and more.